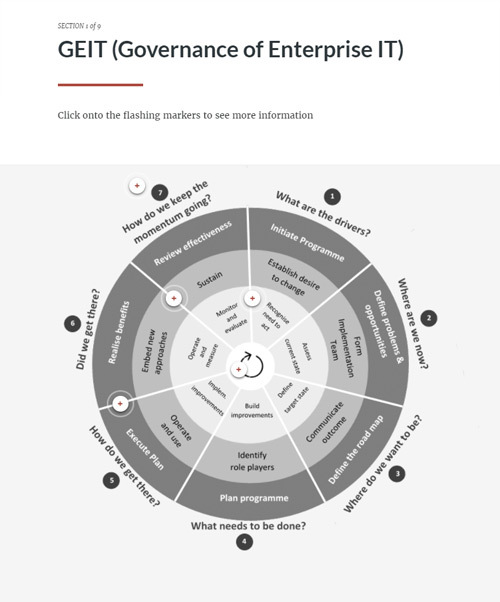 GEIT (Governance of Enterprise IT) enables the enterprise to take full advantage of IT, maximising benefits, capitalising on opportunities and gaining competitive advantage. The implementation of GEIT within an enterprise is a complex and challenging task. As a way to help with the implementation of GEIT, COBIT 5 applies the continual improvement life cycle, which it presented in COBIT 5 interactive guide. Download this COBIT 5 interactive guide today and you’ll also get instant access to over 530+ business & IT learning resources!